There are many role models out there that inspire different people. 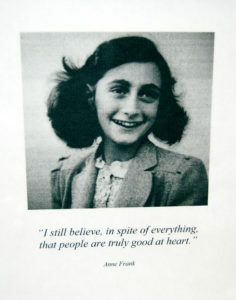 I would have to say that one individual who has made an impact on me is Anne Frank. I believe that Anne Frank made a historical difference because she was only a 13 year old girl telling her story about her experience during the holocaust. When I first read her diary it made me think about things differently. I realized that no matter how scared I am, showing that I’m brave in a difficult situation helps. I also look up to Anne Frank because not once did she ever lose hope. Reading about the life of Anne Frank made me believe that most people have a good heart even if they do the most horrible things. Anne Frank was a talented teenage girl who wrote in her dairy every day documenting the daily struggle of living during the holocaust. Anne Frank was able to tell us her story about what it was like to live in a country full of people that hated Jews, like herself. I look up to her because of how brave she was. If I was ever to be in that situation I honestly don’t know how I would be able to live, survive or even keep calm. Having to be aware and careful and also live with fear every single day is no way to live, but Anne Frank managed to keep positive every day that she was alive. I can only imagine how frightened she was, but she never showed it. I hope one day to be as brave as she was. Anne Frank’s wisdom also taught others that we are all the same, and that no one should be treated differently. She taught others not to judge people because of their skin complexion or because of their religion. I could read her book a million times and I still would react the same way. There are a lot of other people who have made history but there aren’t many individuals out there that have made as big an impact on teenagers. I look up to Anne Frank because she was just a teenager herself when she was separated and taken away from her family by the Nazis. She longed to live her life like a regular teenager. Most people don’t realize that Anne Frank was just like the rest of us. She wanted to go to school, hang out with her friends, and find the love of her life. Even though so much was taken away from her, not once did she ever doubt that things would go back to normal.